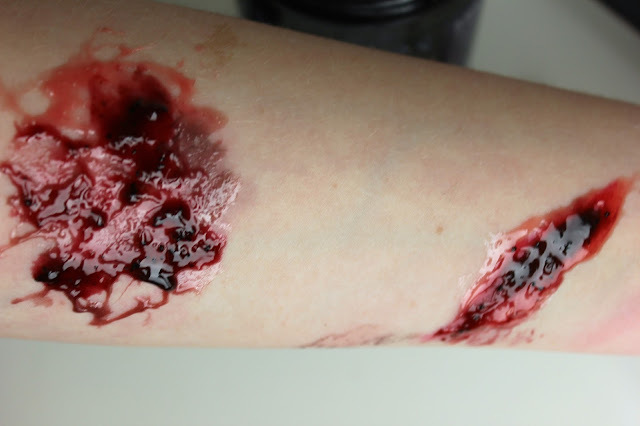 During my course last year, I studied special effects, which is perfect for Halloween. 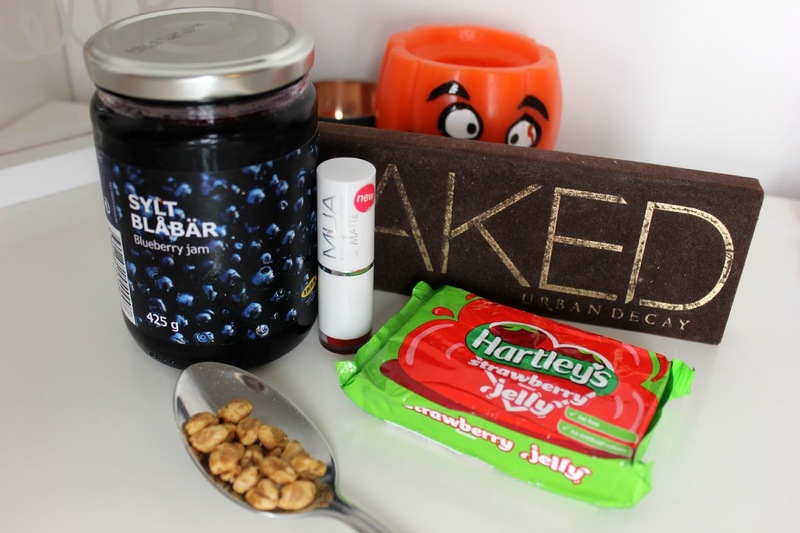 Also perfect for Halloween, was a little cheaper but effective trick to recreate cuts and burns for Halloween, all from the kitchen cupboard! 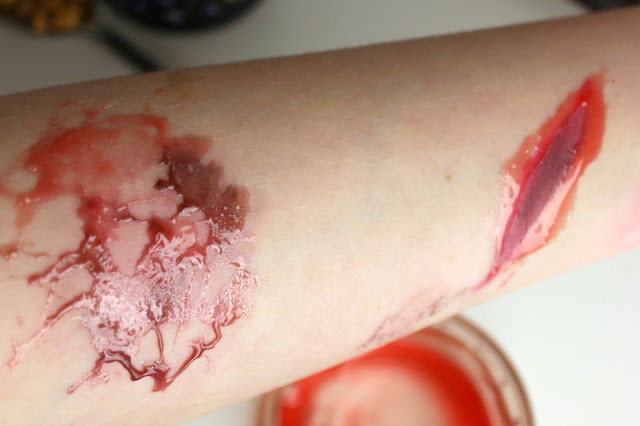 It's also fantastic for a safer way to recreate these special effects, as a lot of special effect products use Liquid Latex, which is very common to have an allergy to. But of course be careful with this way too, avoiding the eyes and testing for allergies and skin sensitivity to products at least 48 hours before. (WARNING) Though if you're a tad squeamish, you might not want to carry on scrolling down this post. 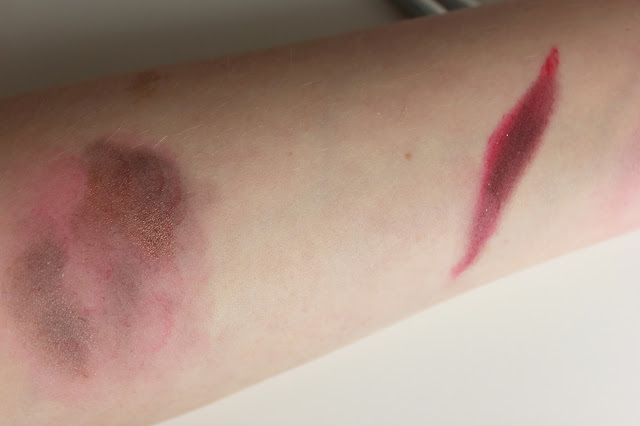 To start off the burn, dabbing on the lipstick lightly to create redness, gives a great base for a fresher burn. The MUA lipstick is fantastic because its waxy, which means if you apply anything over the top it is less likely to move. You can leave it like this, but to give it more depth, adding a black shadow around the edges and/or in small patches dotted all over works the best. The Cut basically consists of drawing a thick wonky line of lipstick as the base, you can then leave it like that if you want to create a brighter and shallower cut. However if you want to create the illusion that its deeper, you can add the black shadow down the centre of the cut. For both of these steps you want to melt a cube of jelly in the microwave, it usually takes around 10 seconds at most. But make sure to watch it constantly and stop the microwave as soon as its melted. Also don't add any water to the cube before melting. Once its melted you want to wait for it to cool, it will be really hot and you don't want to actually burn yourself, while trying to give yourself a fake one! Once the jelly has cooled enough to apply to the skin and also still tacky, just using your fingers to apply it works the best. 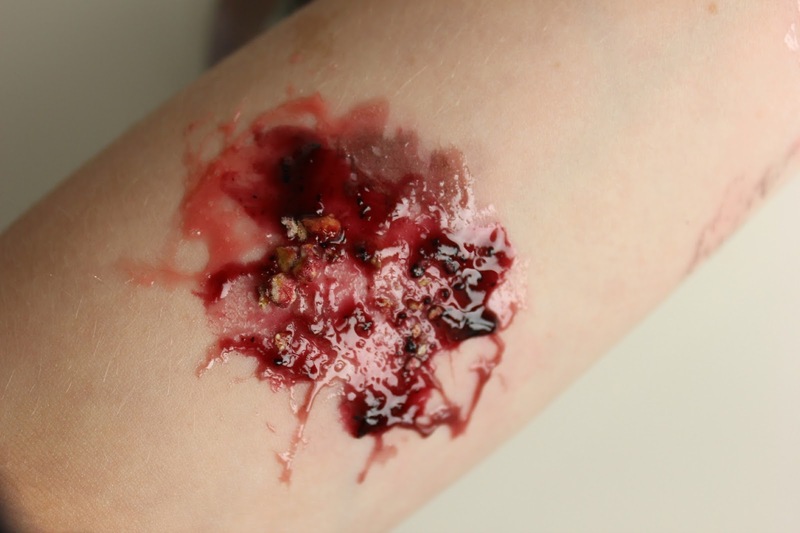 This means that you can tap the jelly all over the skin, which makes it sticky and pulls apart easily. Giving the effect of larger patches and very thin ones. Plus it makes the distribution completely random and not uniformed. For the cut, I started by applying the jelly around the outline already created. This is actually easier as it sounds, as the jelly cools, it goes sort of stringy, letting you apply it precisely. I then tapped round the edges, spreading it outwards so that its thinner. The other great thing about the jelly is that you can build it up, so after the first coat, I repeated the process on top, but just without it being blended. You can finish this one at this step, to have a fresh burn and to do this all you need is jam! Blueberry Jam works fantastically well to darken it up, or you could also use Raspberry too, this will just make it appear brighter. If you really want to get gory though, you can also use marmalade too. All you need to do with the jam is dot it around the burn and thats it, such a quick step and adds the best finishing touch. Blueberry Jam works the best for this one, it looks realistic and any others really won't give the same effect. As its darker it just makes the cut appear deeper. Just fill in the middle part, inside the jelly wall and you're all done! If you want to go all out on the burn, you can also add crushed cereal, to recreate scabbing. Lovely! But it is actually really effective, to make it look the most realistic though, you want to group bits together. Now youre all set for Halloween! You can also lightly powder the top of these, as they do feel slightly sticky, but they work fantastically well to finish off a gory outfit or as a quick fix for a last minute costume! These are so good and look so simple to do but so effective! I wish I was going somewhere for Halloween now so I could try it out! This looks great & so easy! I'd be worried about wearing in the house though in case one of my dogs tried to lick it off haha!